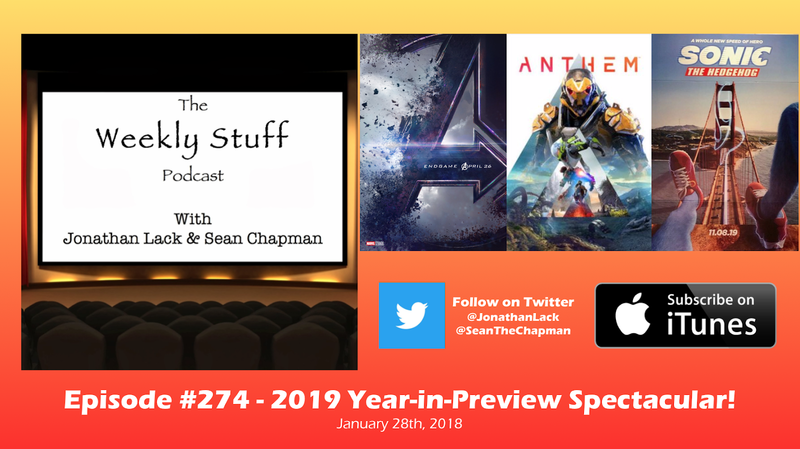 The Weekly Stuff Podcast #274 – 2019 Year-in-Preview Spectacular! This week, we look ahead to the year that is now upon us, 2019, and preview all the upcoming films and video games we know about that are either exciting, baffling, dread-inducing, or a mixture of all three. We also make a competitive draft of which seemingly far-off video games are most likely to actually see the light of day in 2019, while Jonathan predicts just what obscene amounts of money Disney will make on their cavalcade of remakes and sequels this year. We also discuss this week’s big Metroid Prime news, talk more Destiny 2 and Dragon Quest, and answer some listener mail about the upcoming year.